Laptoping is reporting that you can now pre-order the Galaxy Tab 8.9 Tab Android in the United States. It wasn’t that long ago that Samsung officially announced the Galaxy 8.9 Android. 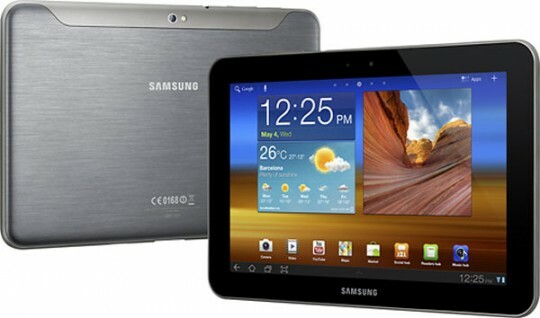 The Samsung 8.9 inch will offer you a resolution of 1280 X 800. So far the Galaxy 8.9 is not available in LTE versions. You can get the WiFi version in both with 16GB of storage and 32GB of storage. Both versions of the tablet have 1GB of RAM and pack a front and rear camera. The front camera is 2MP and the rear one 3MP. You also get a USB port and Bluetooth. You will also get a 1.0GHz dual-core processor. You can pre-order the GT-P7310MAVXAR version with 32GB of storage at Best Buy for $569.99. While the 16GB version GT-P7310MAYXAR will run you $469.99. You can go to the pre-order page by clicking on this link. In late September, the Tab 8.9 will be ready for public consumption. ASIANS CAN ACTUALLY READ MINDS!!!!!!!!!!! think about it, its not normal how alot of them act, and the entire way they act is all to hide their mind reading abilities, it makes perfect sense to do all of that to hide that they can read minds, because all of that is the perfect way to do it! every single asian on the planet is hiding their mind reading abilities, they will lie about having mind reading abilities forever! because they value hiding their mind reading abilities more then their own lives! thats why nobody knows about it! it still happens despite a large number of them having completely expressionless faces all the time, it would just happen alot more if none of them had completely expressionless faces all the time, its not uncommon! the reason you think this truly is crazy, impossible and unbelieveable is because our society has propagandized people into believing that nothing extra ordinary is real and that is really is impossible, and that its crazy to think that its true that people can read minds, all just to cover up that asians can read minds! who says that cant exist? the people who have mind reading abilities who are trying to cover it up! you have to spread the message!!! the world has to know about this!!! !